We all know how important it is to support the men and women in the Military and National Guard, whose selfless service is protecting our country and our safety. Unfortunately, while these brave men and women of are Armed Forces are confronting our enemies abroad, they are also facing unfair treatment in our family and juvenile courts because of lapses in law. CAFC is acutely aware of the unfairness these military service members face, so we took a leading role to educate policy makers and the legal communities. We shared real stories of service men and women who have been impacted, and we provided the data to demonstrate the seriousness of the legal problems facing our service men and women in the family courts. As a result of our efforts in California, Governor Arnold Schwarzenegger signed into law Senate Bill 1082 on September 1, 2005 (see SB 1082 by Senator Bill Morrow / Ducheny). This measure helps protect parents serving in the military reserves by closing a loophole in federal family law that made national guardsmen and other reserve parents vulnerable to legal problems such as spousal kidnapping of their children. This was the first piece of legislation in the nation to really begin addressing some of the problems faced by military parents that passed. As a direct result of our efforts, Michigan and Kentucky soon followed California's example. Moreover, our continued effort to bring this issue to the forefront led to the recent introduction of similar legislation in Florida, Texas, North Carolina, Arizona, Oklahoma, Ohio and Alaska. Most recently, CAFC assisted with the passage of Mississippi's legislation to protect servicemen and servicewomen (signed into law on March 31, 2008). "AWOL Mom Chose Her Daughter Over Her Country"
"Single Parents Who Serve in Uniform Say They Are Losing Custody of Their Kids"
"An Army Mother's Tug of War"
This issue is heightening awareness about the problems faced by our service men and women, but is also pointing out the inherent inability of the family courts to sensibly apply the "best interests of the child" test. These stories really focused much-needed attention on the many problems that plague the nation's family law courts. Since AP broke the story, many other media outlets, such as National Public Radio's nationally syndicated program "Here and Now" and MSNBC cable news have started to cover this important issue. Watch the MSNBC report here. Due to all the public and media scrutiny, on Wednesday, May 16, 2007, the United States House of Representatives passed H.R. 1585 to prevent soldiers deployed to war from permanently losing custody of their children based on their absence. Rep. Mike Turner (R-Ohio) offered the amendment after reading the Associated Press story. Additionally, CAFC was contacted by several other Congressional Members who hoped to introduce further legislation to fix problems not addressed in Rep. Turner's amendments. President Bush vetoed H.R. 1585 but H.R. 4986 was introduced and passed with urgency to fix the problems that caused the veto. H.R. 1585 was the National Defense Appropriations Bill and was vetoed due to language in the bill that would have allowed the current Iraq government to be sued for past bad acts by Saddam Hussein's regime. H.R. 4986 was cleared for the White House on January 22, 2008 and and presented to President Bush on January 24, 2008. As a result, the Servicemembers Civil Relief Act of 2003 (SCRA) -- which protects deployed soldiers against civil legal actions -- was amended to specifically extend the protections of the SCRA to family law proceedings and eliminate default judgments for deployed service personnel. The specific amending language (SCRA section 584) can be seen here. While the language is not as strong as the California statute, where it all started in 2005, it does at least provide protection in all 50 states. Right now H.R. 6048 is pending to further amend SCRA to provide for the protection of child custody arrangements for parents who are members of the Armed Forces deployed in support of a contingency operation. Please visit Military.com to voice your support for our service members. 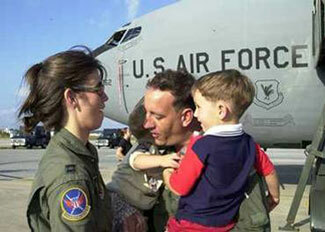 CAFC is still working on other family law issues that affect military parents, and we look forward to more progress in 2008. Much more needs to be done. We are asking everyone who enjoys the protection and freedoms they have — because of these men and women serving our nation — to donate as much as possible so that CAFC can continue to help these service men and women and their families.